Paul's letters to Timothy and Titus, commonly called the 'Pastoral Epistles', are Paul's last letters before his martyrdom. Although written in the first century, they are very relevant for church life today. Contemporary issues such as the inspiration and authority of scripture, the characteristics of church leaders, the role of women, and the nature of holiness were high on Paul's priority list to be passed on to his 'sons in the faith', Timothy and Titus. 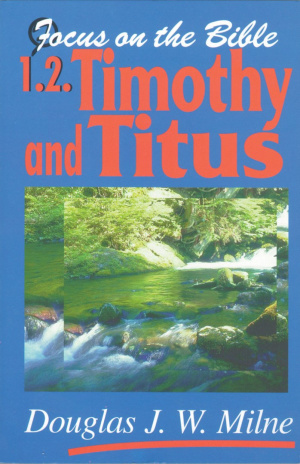 1 & 2 Timothy and Titus : Focus on the Bible by Douglas J.W. Milne was published by Christian Focus Publications in December 1996 and is our 6014th best seller. The ISBN for 1 & 2 Timothy and Titus : Focus on the Bible is 9781857921694. Be the first to review 1 & 2 Timothy and Titus : Focus on the Bible! Got a question? No problem! Just click here to ask us about 1 & 2 Timothy and Titus : Focus on the Bible.